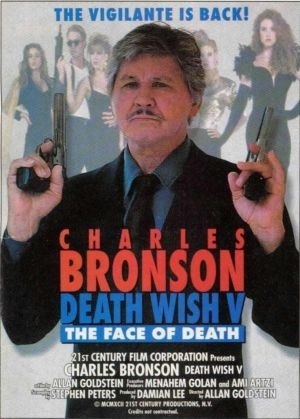 Death Wish V: The Face of Death was released in 1994 and it was 20-years after the groundbreaking original film, which shaped the vigilante film and made a leading man out of Charles Bronson. Starting with the 3rd film Bronson’s Paul Kersey became a superhero of sorts with a whole arsenal of weapons and Death Wish V goes back to more of the style of the original film, but with more action scenes. 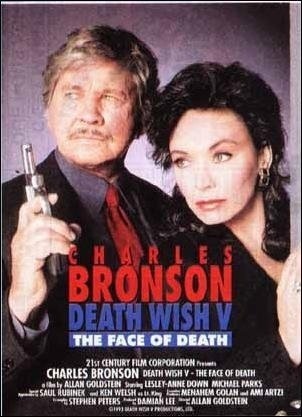 This film marked two ends with the first being this was the very last of the series (though 6th film was announced called Death Wish 6: The New Vigilante, but never came to be) and this also marked the very last theatrical film for Charles Bronson as after this he made a trilogy called Family of Cops all being made for TV. Like with the first and third film, Death Wish V returns to New York and one thing for me about the series is even a weaker Death Wish film is still rather fun and I guess this would be the weakest of the series just edging out the 4th film. The budget seems lower and production values a little on the cheap side also despite being set in NY this was filmed in Canada and at least to me it’s easy to tell this isn’t NY. The 3rd film was set in Brooklyn was mostly shot in the UK and sure it doesn’t exactly look like Brooklyn, but I felt at the very least it was passable, but not this one. Paul Kersey (Bronson) is back in New York and living with his girlfriend Olivia (Down) who is a fashion designer. At a fashion show Olivia’s ex-husband and father of her daughter, Tommy O’Shea (Parks) shows up and muscles his way into getting a cut of the profits, but when Olivia decides to testify against O’Shea he sends one of his henchman to mar her face. Angry and wanting revenge, but Paul decides to let the law handle things this time around and when Olivia decides she will still testify O’Shea’s mob show up at their house attacking Paul and Olivia and end up gunning her down (hey this is a Death Wish film you knew that was coming). Her daughter Chelsea (Erica Lancaster) is sent to live with her father and Paul now reverts back to his vigilante ways to avenge the death of Olivia and get Chelsea back from her evil father. The screenplay by Allan A. Goldstein more or less follows suit with the first 2 films as this film drops the big action scenes of the last 2. This one perhaps is a little more character driven than most of the Death Wish films. While this was a good idea to bring the series back to where it started, but by this point there was really nothing left to explore and the film may have been better suited keeping the over the top action scenes. However there is still plenty of action, but most of it is confined to the last act. At first Paul decides to let the law handle things, but problem is a lot of the scenes prior seem like filler. In the first film it worked well, but by this point Kersey has already killed so many thugs it was like 2nd nature to him. If this was the first film or even 2nd having Kersey decide to let the law handle things would have worked much better, but again by this point killing thugs was 2nd nature and fans of the series wanna see Bronson taking out thugs. Overall the script was a bit weak and while I guess 2-4 weren’t exactly masterpieces in terms of writing they worked well and had a sense of humor about them, but Goldstein writes the film in a more serious tone and the script simply wasn’t well enough written. There are some good ideas here and not a total failure, but if anything it’s brought down by really having little too offer. The script is a bit cliched and O’Shea and his gang could be taken from any other film. Though with that said there are some really great lines in this, but its just not as fun as other installments. As director Allan A. Goldstein delivers a fun film, but pacing can be an issue at times as the longer it takes for Kersey to do his thing Death Wish V can be a bit slow, but never boring and at 95-minutes it can be a little overly long. For the most part Goldstein wants to make more of a crime/drama and as I stated before at this point of the series we wanna see Bronson taking out thugs. I have no idea what the budget for the film was, but it does look a little cheap and sort of has that DTV feel going for it. Action wise, Goldstein tones down the over the top action sequences of the 3rd and 4th film for the most part. The action might be the weakest of the series, but they still entertain. I like what Allan Goldstein wanted to do with Death Wish V, but being the 5th part it doesn’t work as well as also Death Wish V really had nothing new to offer the series much like the 4th part. While not poorly made or anything I think the film just suffers from taking too long to get going. At the time of the release Charles Bronson was 74-years old and going up against people half his age, but I never really had a problem since it isn’t like hand to hand combat so his age never really bothered me, but he was getting a little too old for these roles I suppose. 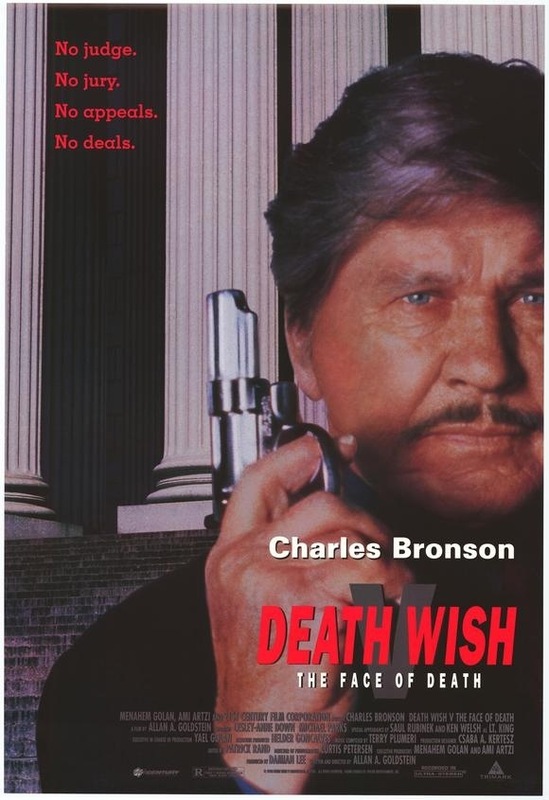 Regardless Bronson is once again great as Paul Kersey and of all the great roles he had Death Wish is his legacy. Michael Parks is one of my favorite actors and he’s over the top here, but it worked well and fit the character. Death Wish V actually does have a very good cast of character actors and that in part probably helped make up for some of the flaws. Overall Death Wish V is probably the weakest of the series and like I said I liked how this went back to the style of the original, but really by this point it just didn’t work. Despite that fans of the series should still enjoy this one. Even a weak Death Wish is still a ton of fun.